Since its founding in 1992 by Kinglsey brothers Chris and Jason, Rebellion has primarily focused on making games for other people. In recent years that has changed, with the Oxford-based media firm taking its destiny into its own hands. This hasn't come without its own set of challenges, CEO Jason Kingsley OBE tells PCGamesInsider.biz, but the end result is a company that is more profitable when things go right. "One of the things about making the transition from work-for-hire to working for ourselves is the change in the things you need to do every day to keep the business going," he explains. "When you're working with other people and they're paying the bills, you necessarily have to involve them in a lot of decisions. They want a lot of involvement. You end up with lots more communication and a lot slower sets of decisions being made because it has to go through a process. Working exclusively for ourselves and with a few partners that we're working with to develop games like Arca's Path means that we can focus on making games. It's been lovely. And from the business perspective, it's also more profitable, too. It's probably twice as profitable when it's successful working for yourself, but then you are taking on more risk. That makes sense." 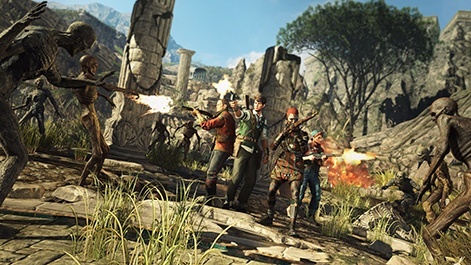 Rebellion's next title is Strange Brigade, a co-op shooter inspired by a style of 1930s films called the Cliffhangers. These were pulpy outings that were designed to get a majority male audience into the cinema on a Saturday morning. They would always end on a - you guessed it - cliffhanger, compelling the audience to come back the next week. Though most famous for its gory Sniper Elite and Zombie Army games, Strange Brigade is more of a family affair. Strange Brigade is a new IP that features four-play co-op. It's also way less bloody than prior titles; something that came from the developers at Rebellion wanting to be able to show their children what they did at work. "We are quite well-known for doing quite gruesome shooter things," Kingsley says. "Sniper Elite is a stealth shooter which has that kill cam that it's rightly famous for. It's designed to make people think about what a bullet can do to the human body. Then the Zombie Army series is a horror shooter - what I call wet horror, there's lots of guts everywhere. We wanted to make an action shooter that was a bit more family friendly, one that had a different attitude. It's not necessarily easier, but it isn't gruesome or so horrible. That's really where Strange Brigade comes from - it's in our comfort zone of action shooters. It has four-player co-op but you can single player. It's a bit more light." Speaking to PCGamesInsider.biz at Gamescom last year, Ghost Ship Games, the developer of fellow co-op shooter Deep Rock Galactic described this genre as being "underdeveloped". Asked whether he feels the same, Kingsley says Rebellion doesn't really pay attention to trends. 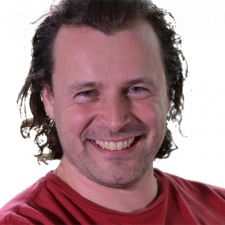 "We tend not to do much in the way of market research before we work on a game," he says. "We tend to work on games that we think would actually be fun to play and make. We hope that there's a market for it afterwards. In a way, we had a huge success with the Zombie Army series. We didn't expect it to be a massive success, it was more a fun game that we wanted to put out there and see what people think and it suddenly became a bit of a juggernaut. That was absolutely huge. I remember talking to the team when they started doing Nazi Zombie Army, the first one, to not worry about console, this was for PC alone. We expected to sell a few thousand copies but we ended up selling hundreds of thousands so we put it on console. When I told the team we had to do a console version, all their faces lit up. In business, when you are doing things, you have to capitalise on good fortune. We hit the right price point and everyone loved it and it was selling incredibly well. 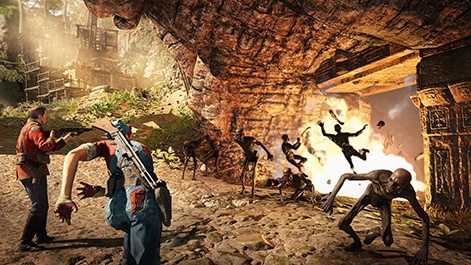 I'm hoping that we'll get a little bit of that co-op love from Strange Brigade. It has a lot of the same elements of co-op gameplay." We tend to do our expansion opportunistically. When things pop up on our radar, we take a look. We're not specifically looking for acquisitions. We're privately owned so we can make decisions quickly and we'll go look at the opportunity, whatever it might be. As well as boasting a game studio, Rebellion also several different media arms. The Oxford firm is also one of the UK's biggest independent book labels and also produces comics. This comes with several advantages, but managing them together requires a far bit of planning. "If we need to find writers who are really good at genre, we have a lot of writers to work with who are freelance to do our books and comics," Kingsley explains. "If we need some artwork drawing up for a poster, we'll just get on the phone to the comic book people and see who they'd recommend. There's a lot of synergy there. It's just nice to be able to tell stories in a slightly different way in a different medium. Video games are brilliant - they're a major component to our business, but at the same time books and comics are also huge. We're one of the biggest comic book publishers in the UK and one of the bigger independent book publishers as well, which is quite shocking to think about. But video games is vastly bigger than books or comics." And speaking of other media - Rebellion recently signed a deal with Duncan Jones - of Moon and Warcraft fame - to direct a Rogue Trooper film. "It's very exciting," Kingsley says. "Duncan and Stuart [Fenegan, producer] are good friends of mine and we're looking forward to working with them much more. We've been working together lots to get to this point. A lot of work still needs to go into it. We're writing scripts and looking at ideas. It's a joint venture, so we'll be very involved just like we were with Dredd - perhaps even more so. That's our direction moving forward. We'll be teaming up with people rather than licensing our work out to other people." Earlier this year, Rebellion swept in to save Warwick's Radiant Worlds. That studio had been working on a game for South Korean firm Smilegate - but this was cancelled leaving the developer facing closure. "A lot of good people that we had worked with before who are good friends with are," Kingsley explains. "Warwick's not too far away. We needed more people. We have run out of space in our massive office in Oxford and are doing building works to expand those but that won't be coming online for a year. It was just an opportunity to work with a talented bunch of people that unluckily haven't had a title actually come out for three years. They were working on this big online title for Smilegate and it was just an opportunity to add to our development roster. We're covering a big swath of the UK. We haven't got anywhere in Scotland yet, or the North East, or really far down South. That's a good chunk of the UK covered for hiring." Asked if Rebellion is on the look for further acquisitions, Kingsley explains that the company's purchase strategy is more opportunistic. "We tend to do our expansion opportunistically," he says. "When things pop up on our radar, we take a look. We're not specifically looking for acquisitions. We're privately owned so we can make decisions quickly and we'll go look at the opportunity, whatever it might be. Could be IP, another studio... all sorts of bits and bobs you can imagine would have value for a company like ours that does lots of different types of stories - books, comics, games, now TV and film." For the next year, Kingsley has high hopes for Strange Brigade and says that Rebellion is going to be making better - or perhaps more - use of the 2000AD license. "I would hope that Strange Brigade would be a huge success critically as well as financially," he says. "I hope that we are in production in the Mega-City One TV show, as well as the Rogue Trooper film. There are a couple of other big projects which haven't been announced yet which I am hoping will be starting to take shape. The next few years could see a lot more broad media from Rebellion than before. There haven't been enough 2000AD based things out there, whatever those things might be. I'd like to see more of them. We've been working on them for a good few years."